I wasn’t sure what my oldest son was going to be so I decided to make my own costume. 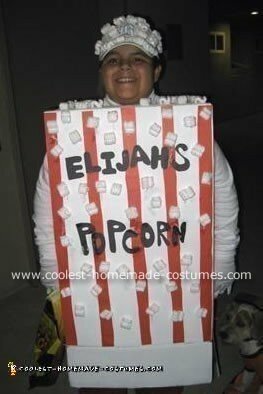 All I needed was a box , white paint , red construction paper and a lot of those Styrofoam peanuts you use to mail out breakables for this popcorn costume. Painted the box white , made 3 holes one for the head and two for the arms. I cut the red construction paper and I glued them on. I have the letter stencils so I put his name on it to make it more personal. It was pretty easy. I did it the day before Halloween and everyone got a kick out of it.